Nail Art for Dummies | I'm a Nail Dummy trying new nail art styles, come try along with me! Ah, the joys of being sick and moving. No time and no interest in doing proper nail art! Luckily I’ve more than enough polishes that are screaming to be tried, so this week’s all about random colours I love on their own. 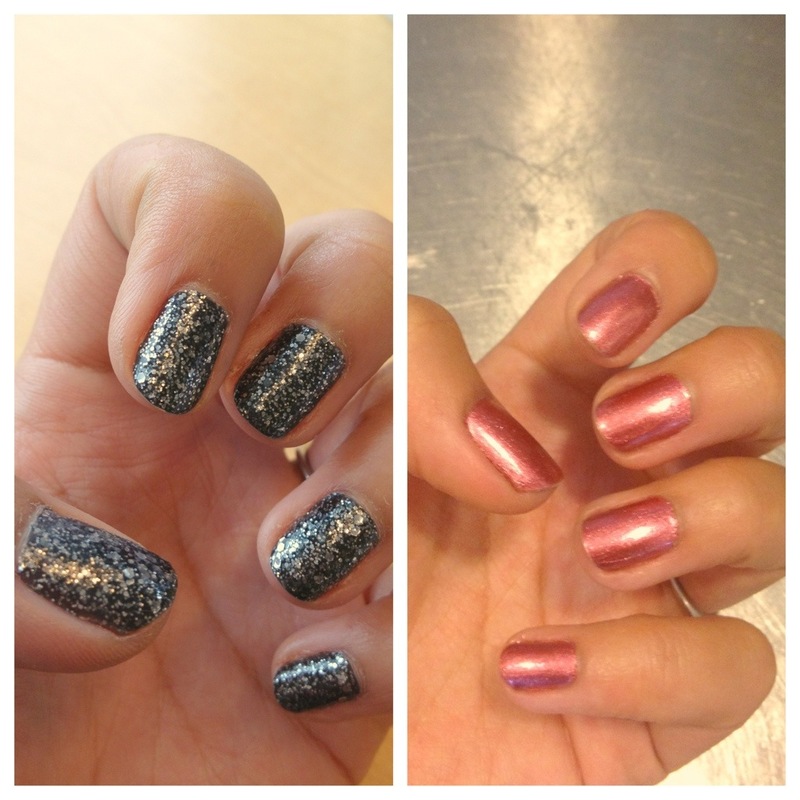 Left is Nicole by OPI ‘Luke of the Draw’ from the Modern Family series. I used 3 coats of it, and I just loved the final look and how it lasted over 5 days! Awesomesauce. To the right, what I’m wearing today is Sinful Colors ‘Dancing Nails’. I haven’t been using SC for long, but so far I’ve been quite satisfied with their colours and how good it goes on. This metallic rose is no exception, it looks great and is definitely good enough to wear on its own. So if you got 2 dollars to spare, then you’ve no excuse for not making your nails pretty! I’ll be busy for at least another week, so my next posts will feature more of my fave single colours! I love this colour so much, that for the nail art bit I wanted a piece to make it real summery cute. To achieve that I chose 2 bows with a little bling that I found, of all places, at Poundland in Edinburgh a while back (ladies in the UK rush over there now). I used just a tiny drop of nail glue to secure them, and waited about 15 minutes before using my hands again. As these bows are a little bigger, you want to make sure they’ve set real tight otherwise they’ll fly off in no time! Anyways, off to do some more snoozing! Today I finally found some inspiration again – this week, in case you were wondering, I was so busy with other things that I got my first nail art black out…the ideas weren’t coming at all! But luckily the slowly but surely improving summer here in Holland gave me a design to work out at long last. I wanted a bit of a funky sunset to sponge on, and for that I chose 3 polishes: Sinful Colors ’24/7′, my go-to neon pink of the moment, ‘Crystal Clear’, some playful glitters, and Catrice ‘Ernie and Birdy’, a light yellow with a slight shimmer. First I did just 1 coat of the yellow, but made sure it did cover fairly well. Then, I took a triangular make up sponge, cut it in half (so I can use the other half for a future design), grabbed some aluminum foil and a nail stick. I added a blob of pink and a little yellow on the foil in such a way that it just touched. Then I pressed the sponge on it, and dabbed it carefully over each nail , moving left/right and slightly up/down until I got my desired ombre look. Recently I got different colours of striping tape from the amazing Born Pretty Store (seriously the best online store for nail art props! 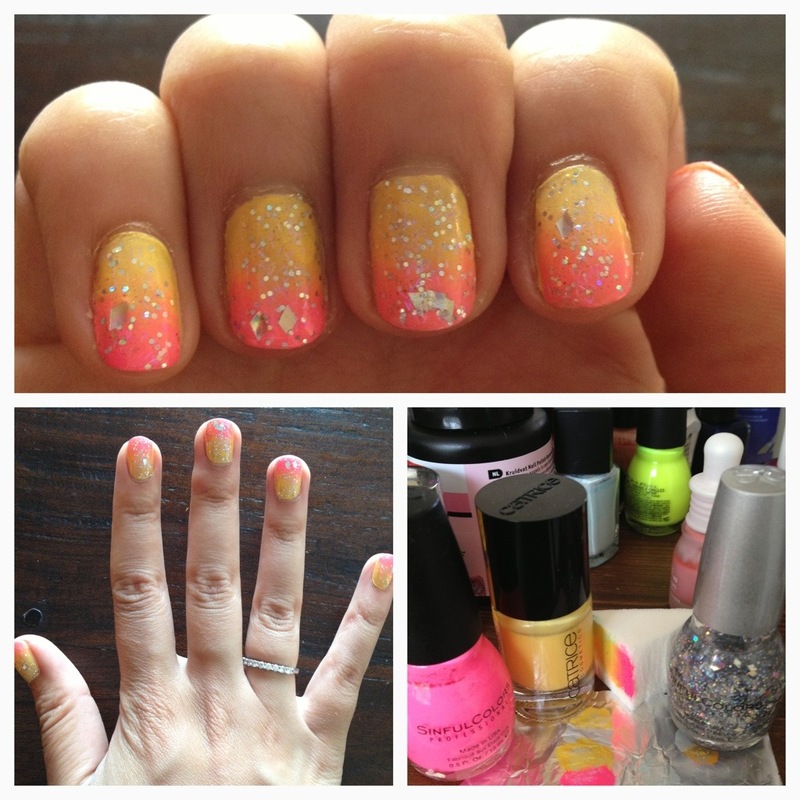 ), and I’d been trying to figure out how to use it in a design…and in comes the equally amazing Barry M! When I was in Scotland a couple of weeks back, I went straight to the closest store carrying Barry M nail polish as I adore that brand! One of the shades I got was ‘Navy’. It’s exactly that, a rich, creamy shiny navy. 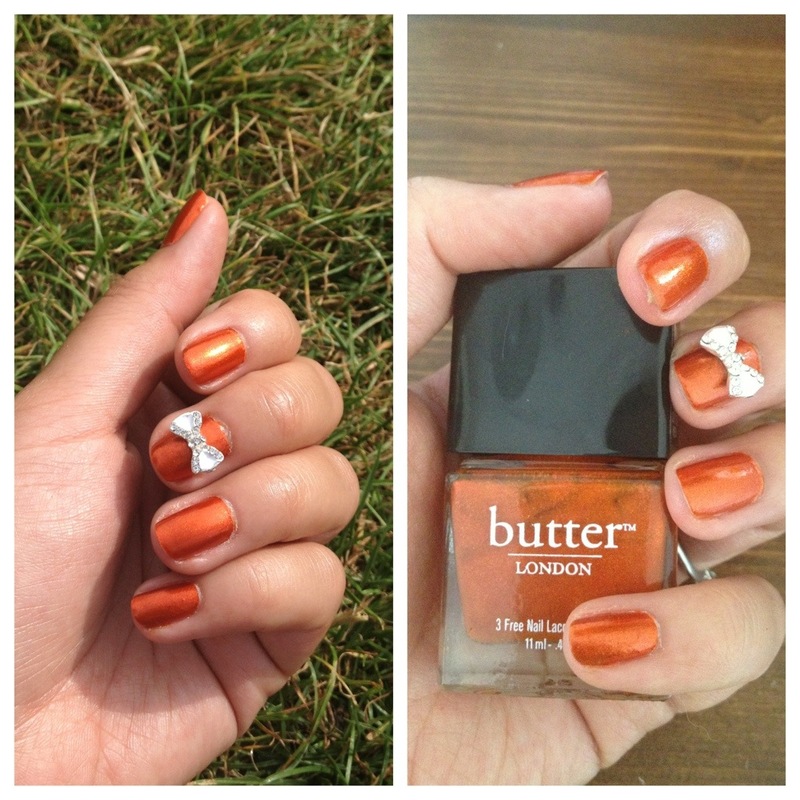 One coat could do the trick, but I did two anyway to get a really swanky look. Once it’s on kind of straight, take your thinnest pair of nail scissors and cut off. Then, tuck in the tape down the sides of your nail and cut off any bits that are still too long. You want a very snug fit as otherwise you might accidentally peel off the tape! After finishing each nail, I instantly painted on a coat of fast drying top coat, also to seal it in better. 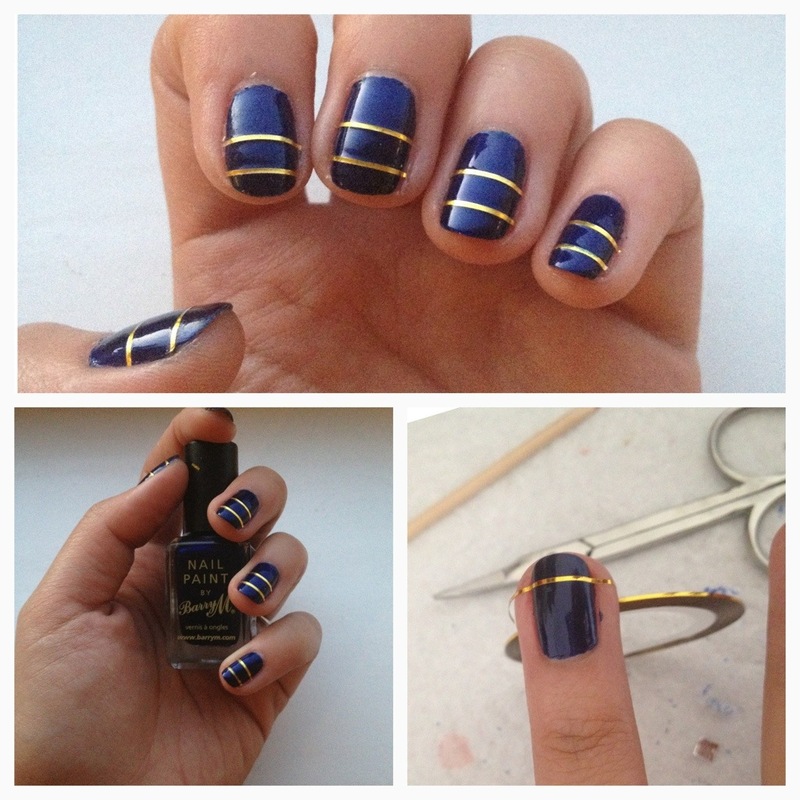 Ahh…slowly but surely I’m getting more ideas again for my nails. Today again I wanted to try out a couple of polishes I bought lately, and after some unsuccessful attempts my eyes caught this ‘instant galaxy nails in a bottle’ kind of purple-blue colour with a subtle glitter, also known as Nails Inc ‘Franklin Row’. As I was obviously too tired to draw on stars and such to make it a true galaxy design, instead I grabbed my bottle of Elf ‘Pixie Dust’ and that did the trick just fine – I love the subtle shimmer flakes! Today’s nails: if there’s no rainbow in the sky, paint them on instead! 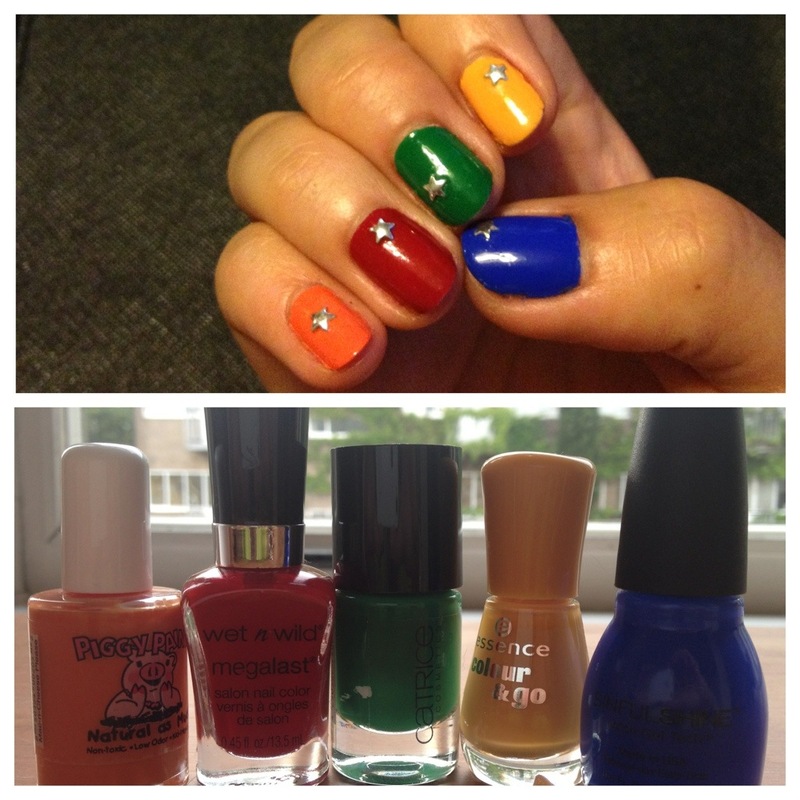 So I was behind a bit on nail designs lately…what’s better to catch up than just using 5 different colours? This design is so Nail Dummy proof, all you need is enough bold shades of polish and, if you’d follow exactly what I did, a couple of cute starry studs. I chose mostly cheaper colours – all together this costs less than one bottle of fancy polish, which means you have no excuse for not buying them! The blue is a favourite of mine, Sinful Colors’ Sinful Shine ‘Endless Blue’. Next up, the yellow by Essence, ‘Little Miss Sunshine’. My middle fingers are painted with Catrice ‘I’m not a greenager’. Followed by the cheapest but arguably the best colour red, Wet ‘n’ Wild ‘I red a good book’. Last but certainly not least, the orange. It’s by an awesome natural polish brand called Piggy Paint. Not only non-toxic and kid friendly, it’s also just great stuff to paint on! It’s targeted towards mothers to get for their young girls, which is great but I’m still 12 inside so I can use it as well 😉 The orange I used here’s called ‘Mac-n-cheese please’. Hello ladies and a couple of gents, I’m home at last for a full 8 weeks, so I’ll have more time to blog again! This week I was working in Madrid, Spain which inspired me to do something in their flag colours red and yellow, and being busy as I was that quickly turned into a leopard design. I’ve done a couple of other leopard prints on this blog so it’s not very new and original, however it’s still very on trend and I love the design, regardless of the colour combo used. For this particular design I took Barry M’m Gelish in red, did 2 coats of that and let dry. Next, I took a black nail art pen (mine’s from Claire’s) to draw the leopard ‘C’ shapes and occasional dot and stripe. Make sure you get a real nail pain and not just nail art polish with a long thin brush – I find it LOADS easier to really draw it on. Once the stripes are dry, I coloured in the spots with Hello Kitty ‘Banana Cream’, quite spot on name for this creamy yellow. I admit to having bought this just because I thought the bottle was cute, but this colour actually is really nice. As last step, but not least important considering I used a nail art pen for this design, I sealed it in with a generous coat of Seche Vite top coat (you can use any other fast drying top coat as well). I almost patted it on to avoid smudging. Happy rest of your weekend!